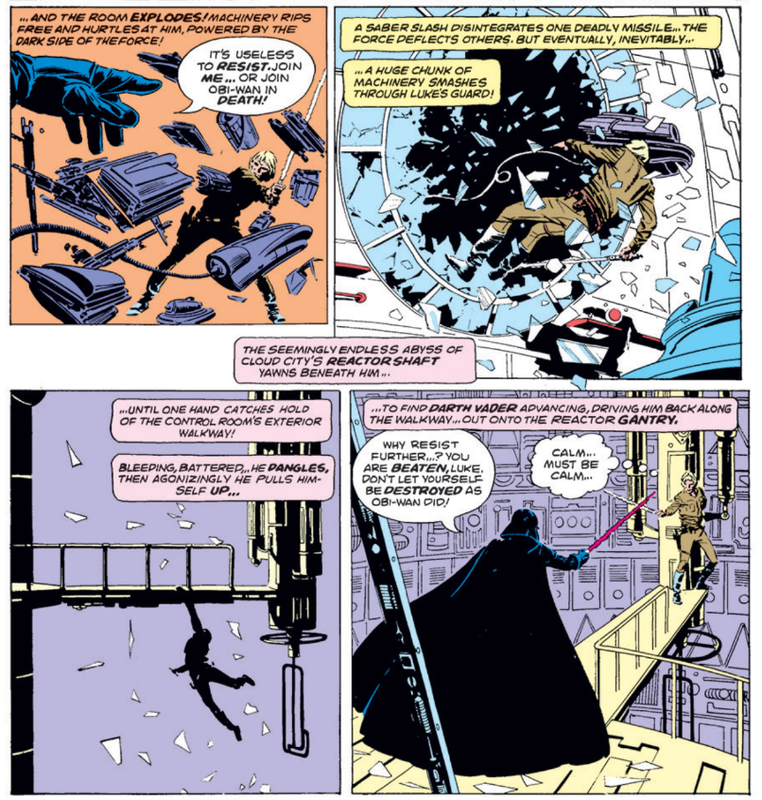 Finally, after several teases and indirect confrontations, Luke and Darth Vader battle one another directly, lightsaber-to-lightsaber, for the first time this issue. This in turn leads to the big shocking revelation Empire is known for, the reveal that Darth Vader didn't kill Luke's father, he is Luke's father. 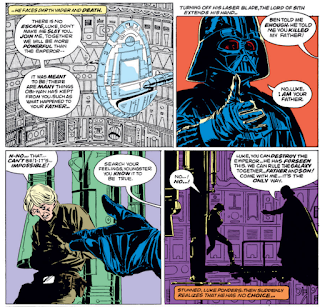 It's a revelation that immediately changes the nature of the story, and it's hard to tell whether it feels natural or not relative to the series' previous depiction of Darth Vader (in part because when reading that Vader, even doing my best to view the character as the writer and audience at the time would have, it was still hard not to think of him in this context). At any rate, it will be interesting to see how the series deals with this information, as it's the kind of thing the series could get a lot of mileage out of, yet will likely be firmly controlled by LucasFilm. Prior to that, Luke loses his hand and lightsaber during the duel, and I'm curious how the series handles Luke not having a lightsaber as well. More pinups in this issue, including our first comic book look at the Ugnaughts and a piece by Fred Hembeck. This is Archie Goodwin's last issue as editor of the book (a post he's held since issue #11), though he still has a few upcoming stories he wrote yet to be published. He says in an editorial on the letters page that he's stepping down due to increased responsibilities with Marvel's Epic Illustrated line, but I suspect he may also be a victim of Editor-in-Chief Jim Shooter's edict that editors can't write their own books (that is, a writer needs an editor who is not him or herself). This issue confirms Han did indeed survive the carbon freezing process, though it will be quite some time before we see him again sans carbonite. 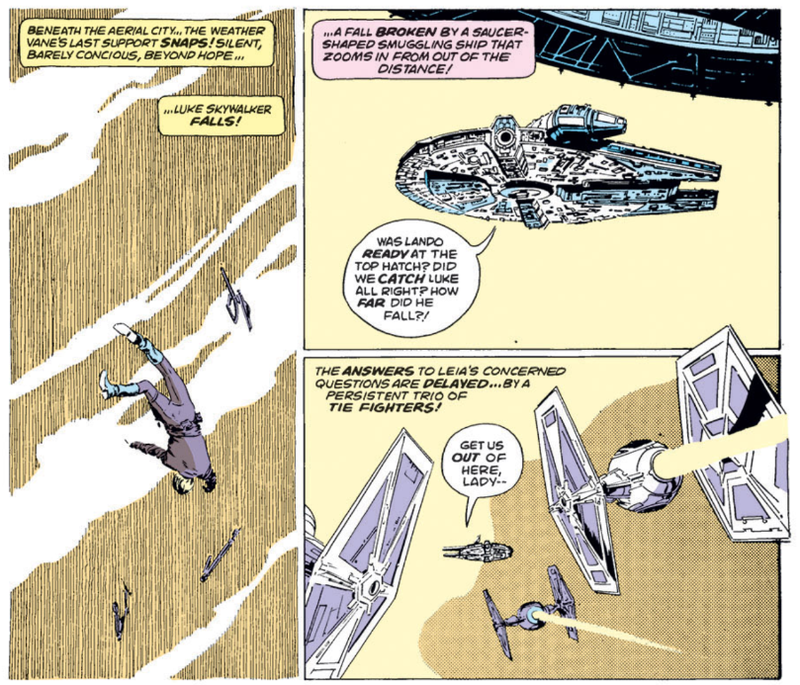 As in the movie, Lando and Chewie end this issue heading for Tatooine, which is another interesting pick-up point for the series, since there's a fair amount of time that needs to pass before Jedi begins and closes out this plot thread. When arguing with Lando over the changing nature of their deal, Vader gives Lando a little Force choke, something I don't recall happening in the movie. 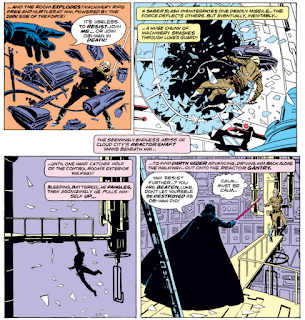 The duel between Luke and Vader unfolds a little differently than in the movie, with Luke's fall through the window after being pummeled by Vader leading directly to the catwalk/gantry where he loses his hand. 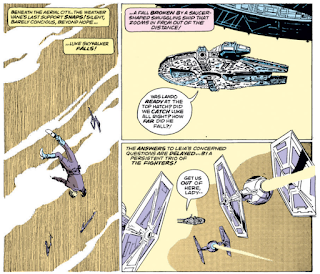 A little bit of added tension is added to Luke hanging off Cloud City, with the vane slowly loosening under his weight, culminating in Luke actually falling onto the Falcon, instead into Lando's waiting arms. Speculation has already started as to the identity of the "other" referenced by Obi-Wan and Yoda as Luke left Dagobah, with a letter writer in this issue suggesting Lando. The Empire Strikes Back adaptation concludes here with minimal fuss, depicting events mostly as they unfolded on screen, with just a few minor variations (mostly due to the differences in medium). Overall, this film adaptation is much more successful, at least in terms of overall enjoyment, than the New Hope adaptation that kicked off the series, and that's mostly down to one thing I never talk about nearly as much as I should: the art. For one, the art throughout this story is much more consistent than with the previous adaptation, as Howard Chaykin was assisted by a seeming revolving door of inkers throughout that story, his style seemingly changing from issue to issue. For another, the Williamson/Garzon art is just better. 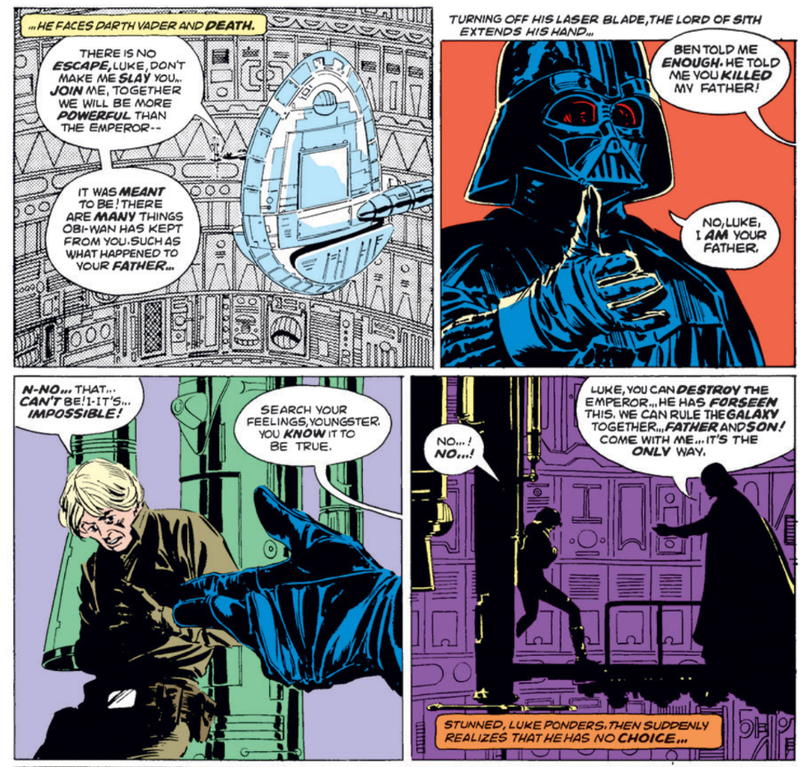 Not only in terms of photo-realism, enabling the characters to look more like the actors playing them, but also in terms of overall craft, the way Williamson & Garzon (and Wein and Veitch) lay out panels, use color and shadow to depict mood, and alter the level of character and background detail throughout the story. When this adaptation started, I bemoaned that Carmine Infantino was pushed aside just for the duration of this story, and while I still think the series as a whole would have been better served if its regular artist was allowed to draw its biggest story yet, there's no denying that this adaptation succeeds on the strength of Williamson & Garzon's art. Look out, he's got his probe! Interesting. 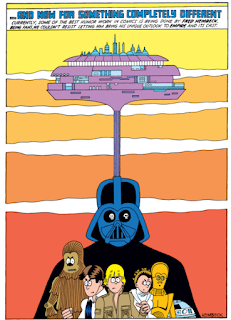 The Dark Horse Toshiki Kudo Manga adaptation also had Vader force-choking Lando. Was this scene from the original screenplay? I assume it must be - or at least the draft of the script Goodwin was given as reference. That's pretty much what I assume most differences are down to. I picked up most of the issues adapting Empire off the racks, but only a couple before it following the adaptation of the first film, and I don’t think I got any after this. Curious to see what happens, as you are. Like I said in a comment on the first Empire post, I expect the return to Infantino pencils to be jarring and for the stories to feel, disappointingly, even less like Star Wars now that we’ve had this, but I shall keep an open mind. I just read through all the rest of the EMPIRE adaptation over the weekend, so I'm caught up once more! "This issue confirms Han did indeed survive the carbon freezing process, though it will be quite some time before we see him again sans carbonite." You touched on this last issue, but I thought I'd wait to mention it here: I don't know how the upcoming issues will play out, so I could be pleasantly surprised, but I'm expecting a lot of "treading water". The orignal movie concluded in a pretty open-ended setup. All the characters were in play and, notwithstanding limitations imposed by LucasFilm, they were free to go anywhere and do anything in a universe which had barely been built. But now we're stuck in a holding pattern. Luke is partially trained. He should probably go back to Dagobah, but I'm sure we won't see that happen. Han is out there and our heroes should be looking for him, but obviously they'll never find him. 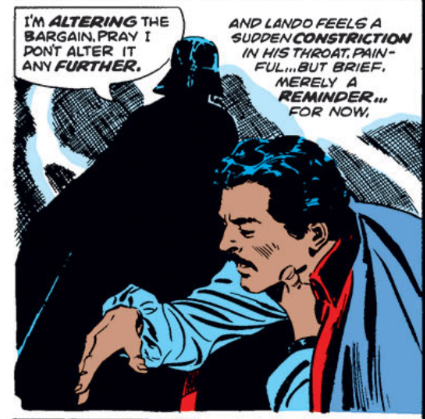 Lando is here but he's a cipher; will he receive any character development? Luke has no lightsaber; will it remain that way for the next three years? 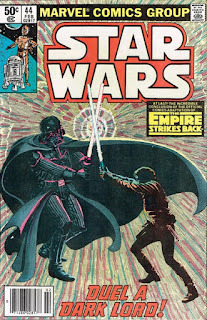 Lastly, to speak to Blam's point -- I really like Carmine Infantino's artwork for the post-NEW HOPE, pre-EMPIRE comics. He fits that undeveloped universe and the "space adventure serial" aesthetic Goodwin was going for. But I'm not sure how well his stylized artwork will fit into the post-EMPIRE universe. The mood and atmosphere of the story have changed, darkening considerably, and I feel like a more realistic, or at least a more traditional, approach will be necessary. I'll look forward to seeing how Infantino handles the next few issues, but I'm also exicited for the arrival of the likes of Walter Simonson and Ron Frenz (along with Tom Palmer) coming up. P.S. : Teebore, you've now made it all the way through the first STAR WARS: THE ORIGINAL MARVEL YEARS OMNIBUS. Good work! Yeah, I am also very curious where the series goes from here, since EMPIRE (and what unfolds in JEDI) locks up so many avenues of possible development. Plus, the amount of in-universe time between films is much shorter than between ANH and ESB (which, along with the absence of Han, is why so many series are set in that time), even though the amount of time between movies is the same, so Marvel has to worry about crowding in too many big events between movies. I suspect Leia might get more of the spotlight moving forward, since pining for Han aside, she's relatively unencumbered by the end of ESB. Hopefully Lando gets some play, especially since his characterization in JEDI isn't too far removed from the end of EMPIRE. 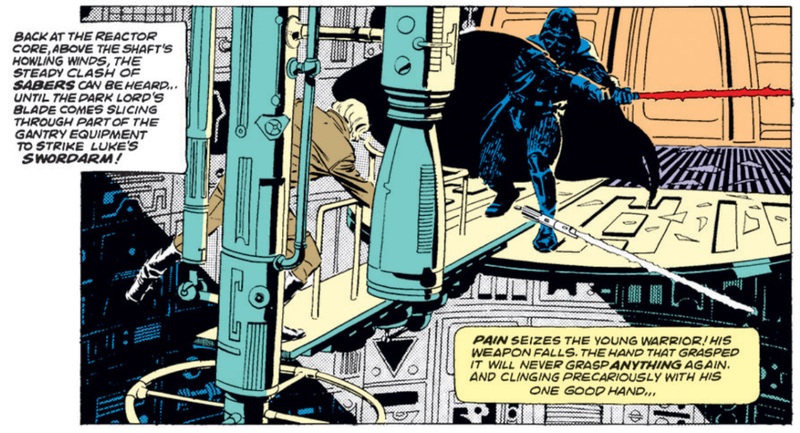 And maybe the layers added to Vader by the film will make creators more comfortable with stories set exclusively within the Empire. 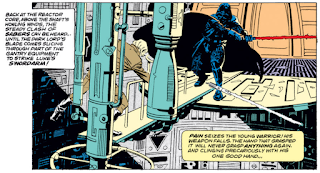 Luke, of course, is the big question mark, both in terms of missing his signature weapon and coming up with missions/crises big enough to justify his not going after Han or going back to Dagobah. It'll be interesting to find out what's coming up! 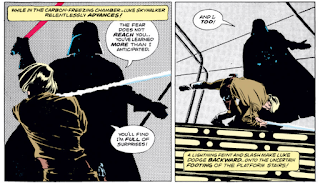 you've now made it all the way through the first STAR WARS: THE ORIGINAL MARVEL YEARS OMNIBUS. Good work!